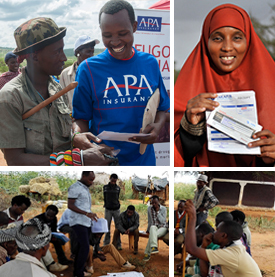 Data from the first (baseline) round of a household survey evaluating the impact of Index-Based Livestock Insurance (IBLI) in Marsabit, Kenya is now available. This information, which is described in a data codebook, is from a pre-intervention baseline survey carried out by the IBLI team between October and November 2009 and complemented with annual follow-up rounds from 2010 to 2013. The International Livestock Research Institute (ILRI), Cornell University, University of California-Davis and Syracuse University in collaboration with implementing partners, UAP Insurance Company and Equity Bank piloted, in January 2010, a market-mediated index-based insurance product to protect pastoralists from drought-related livestock mortality, in Marsabit District. Tags: IBLI, Marsabit. Bookmark the permalink.